These flame-throwing electronic brains are pictured right, towering over the Daleks at their pre-fight introduction in the BBC studios at Ealing, London, yesterday. One puffs a warning. But the Mechanoids will breath stronger fire when they meet the Daleks in a fight to the death soon. 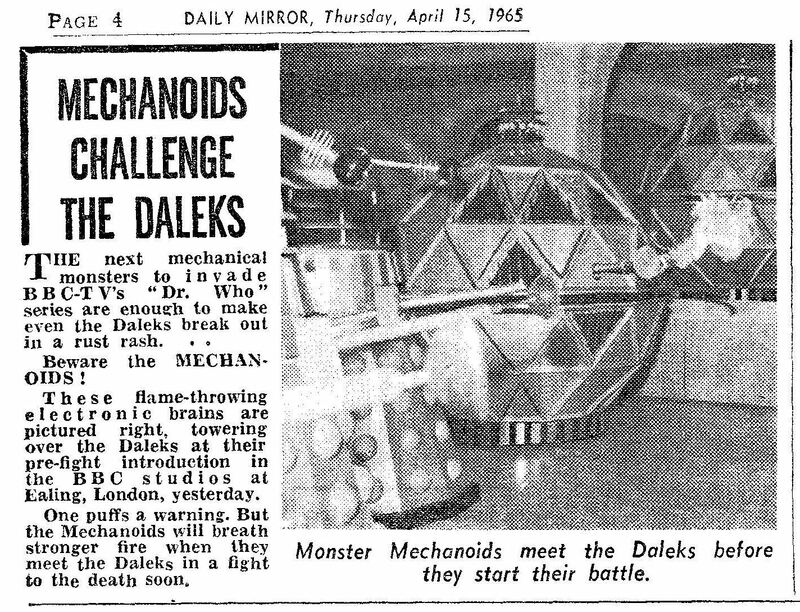 Monster Mechanoids meet the Daleks before they start their battle. APA 6th ed. : (1965-04-15). Mechanoids Challenge The Daleks. The Mirror p. 4. MLA 7th ed. : "Mechanoids Challenge The Daleks." The Mirror [add city] 1965-04-15, 4. Print. Turabian: "Mechanoids Challenge The Daleks." The Mirror, 1965-04-15, section, 4 edition. This page was last modified on 13 July 2017, at 01:32.